Special Delivery! 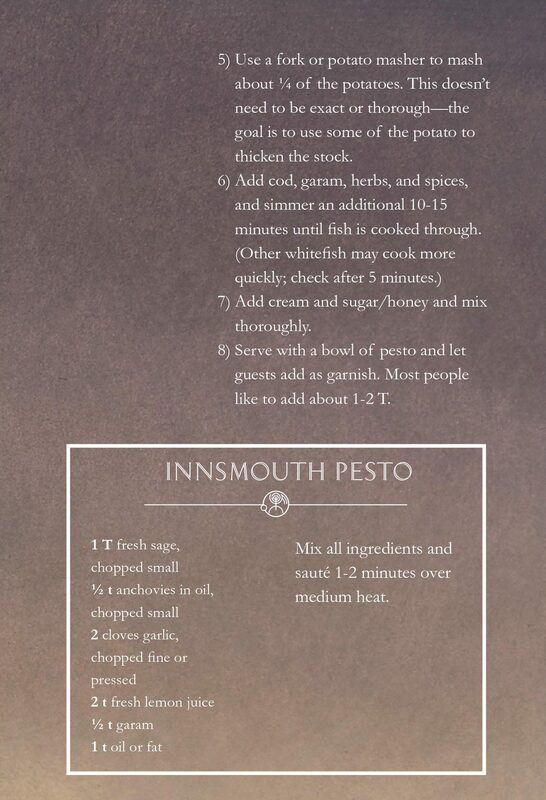 As an excellent addition to Ruthanna Emrys’ delicious Cooking the Books in May, our friends at Tor.com Publishing just sent over printable recipe cards for more Innsmouth recipes! Enjoy! The Innsmouth Collection, buried deep in the Restricted Stacks of Miskatonic’s Crowther Library, is best known—by those who know of its existence at all—as a unique source of folkloric esoterica. The trove of obscure Aeonist mytho-history and demonology texts is certainly abundant. However, the collection also offers less dramatic, but no less fascinating, resources for the anthropologist. Innsmouth, prior to the government raids of the late 20s, provided a fascinating example of an isolated microculture, being to the mainstream of American development as the Basque country is to Spain. Even more fascinating, this embedded but isolate tribe appears to have held much the same relationship to the British prior to their immigration to the New World, parallel to but separate from the first influx of Puritans. Throughout this migration, which their mytho-historic material suggests may have further antecedents, they’ve maintained a separate language, religion, customs—and cuisine. The researcher who gains elusive stack access may not make an immediate beeline for the cookbooks. But the Esoteric Order of Dagon Ladies’ Auxiliary Holiday Cookbook, 1928, holds its own intriguing secrets—even if less likely than the Necronomicon to feature in whispered urban legend at frat parties. Professor Alan Wilksbury, Anthropology Department: “Beyond Folklore: Untapped Resources in Special Collections.” From the Crowther Connections newsletter, In the Stacks column, June 1948. 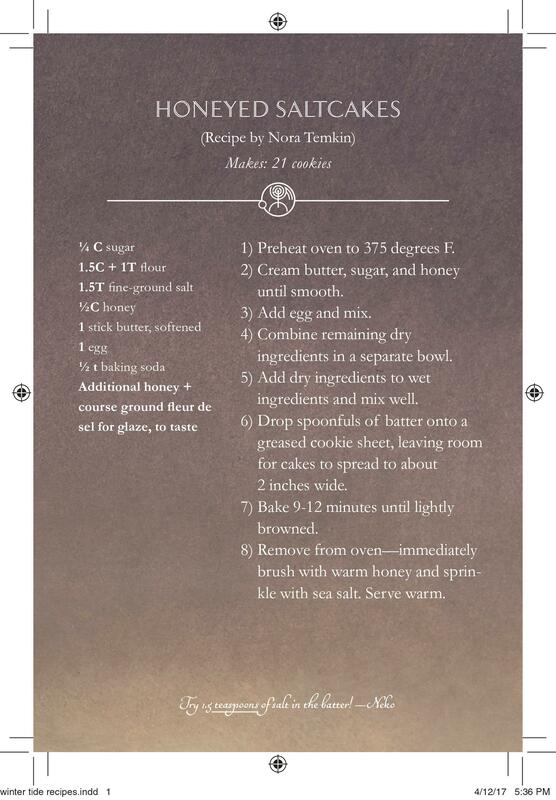 The honeyed saltcakes that Aphra bakes as comfort food, after a long day dealing with angry federal agents and her own demanding familial duties, wasn’t meant to be the seed of a whole invented cuisine. They just sounded like something Deep Ones would appreciate. But cooking is my other art—the one that gets faster feedback and more thorough appreciation than writing—and as publication drew near the temptation to work out a recipe for the real thing was irresistible. And after all, if I bring baked goods to a reading everyone will walk away satisfied, right? Recipes don’t exist in isolation. They flow out of culture, which flows out of history—not only the stream of events, but the places lived, the herbs that thrive there, how many generations back you have to look to find someone who could afford steak. So honeyed saltcakes depend on the many migrations of the Deep One spawning grounds, which in my version stretch from Morecambe County, Massachusetts, back to Morecambe England, and before that the Northern Mediterranean and the west coast of Africa. Click for a larger version! Scroll down for PDFs! This carefully considered history ruled out the frybread I’d initially imagined, inconveniently native to none of those locales. My householdmate Nora suggested something more along the lines of a chewy cookie, and went through three rounds of recipe development to which I contributed two rounds of “Nope, still not salty enough.” (Cooking is my other art; I depend on her to mess around with the more finicky chemistry of pastries.) 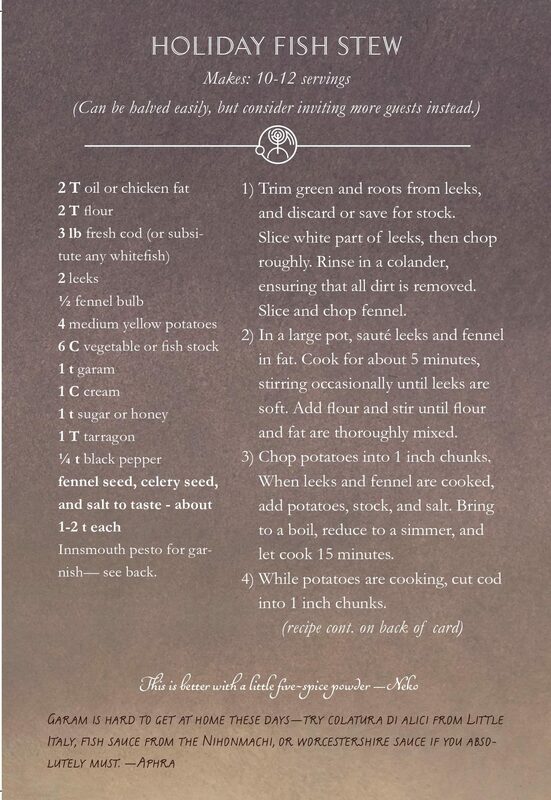 The final saltcake recipe has two versions: one involving 2 tablespoons of salt, suitable for Deep Ones, and one involving 2 teaspoons, suitable for ordinary people of the air. Though many of our beta eaters seem to harbor a little Deep One blood, as do I. Meanwhile, I went to work on a couple of Winter Tide’s savory dishes. 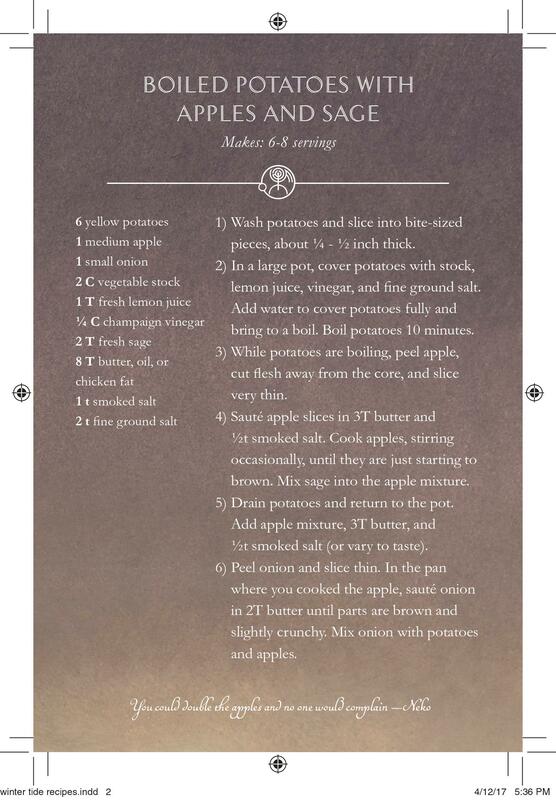 Aphra makes boiled potatoes with apples and sage for the same meal that produces the saltcakes, and mentions the Kotos preparing her favorite Holiday Fish Stew for the solstice. (Some syncretic intermingling of Deep One and Nikkei cooking over the next few decades seems inevitable—that’s a whole ‘nother post with more sushi in it.) I wanted Aphra’s traditional foods to include many of my staples from a Cape Cod childhood. Fish, abundant and fresh from the day’s catch, and more abundant still in her time than mine. Hardy herbs that can stand a Spring frost or three. Apples sweet from the orchard, and every root vegetable that will keep over the winter. To these familiar standards I added more complex flavors from the Deep Ones’ sojourn in an isolated coastal inlet of the Roman Empire. Spices were hard to come by in 20s Massachusetts, but fennel will grow and seed in a New England garden, and garam could be made locally. A little research gave me the excuse to pick up a tiny bottle of colatura di alici, supposedly the closest thing that modern producers have managed. It’s delicious if (like me) you’ve been known to sneak a fingerful of anchovy packing oil, and a little more intensely fishy than Worcestershire or Asian fish sauce. I also gave the Deep Ones a taste for schmaltz shared with my own Ashkenazi Jewish ancestors. Finally, on the theory that people who live in the ocean ought to have a gourmand’s taste for their native element, I took full advantage of a modern foodie’s palate of salts. There’s ordinary fine-ground sea salt. There’s fleur de sel de Guerande, sifted from marshes much like those around Innsmouth. And there are smoked salts—applewood is what I had to hand, and seemed to go well with everything. honeyed saltcake, the actual thing itself, tells you more about what holidays felt like in Innsmouth than the words of any story or ritual.” For me, getting my hands (and spoons, and spatulas) into the scent and texture and taste of those foods was a vital part of coming up with the right words. 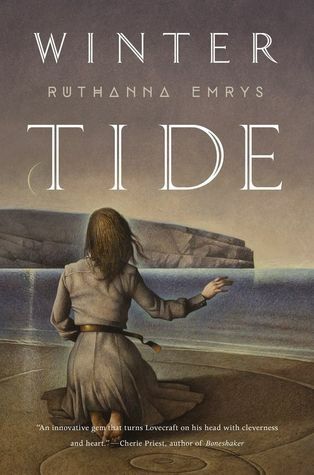 Check out Cooking the Books with Ruthanna Emrys! Previous A Bouquet of Links: UPDRAFT Sale! Invisible 3! PASTE Magazine!